Hmm...i think i don‘t like the front ... FA / Manta will do it. Easy pass for me. Will wait for FA. Hi Cooey is this Limited to one per person? What a lazy release. Same art for both lol. FAC and Manta will destroy this one. WOW (and not in a good way lol). Both with the same art??? I have the first set from WeET but no way I'll be getting this Happy to wait for FAC and Manta WEA. Who would want to buy any more than that??? The level of laziness in this release is just mindblowing. 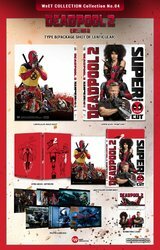 <Deadpool 2> BD Steelbook LE (Weetcollection Collection No.4) will be released at 11th October 2018. 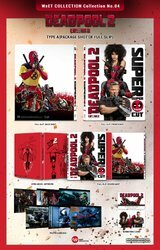 As the Deadpool 2 Artwork Guide has been changed more strictly, please note that the fullslip version and the lenticular O-ring case version will be released same image under the new guidelines that no images can be used other than official images. The item will be sold at the same time into overseas and domestic(Korea). And those are the only 2 official images in existence? No, not liking this. They may have gotten a lot of restrictions but still, there has got to be better official artwork than this? The WWA steel is crap and this slip doesn’t look good to me either. Hope that FAC and Manta are able to come up with something better. Wow WeET just lost a ton of street cred with this release and lost for words how bad this is the only positive is that it’s an easy pass. Will wait for the heavyweights to battle it out Manta Vs FAC. I've already got the less than sterling steelbook, There's nothing here for me but thanks @cooey for posting. Roll on Manta Lab.